This is something I’ve wanted to write about for a long time. I LOVE these types of racks. Good wall mounted racks are like one of the top 5 best developments in recent years. So many of us are short on space in our garage gym or our back room gym. A traditional power rack, or even an open-ended squat rack, takes up a painful amount of space. 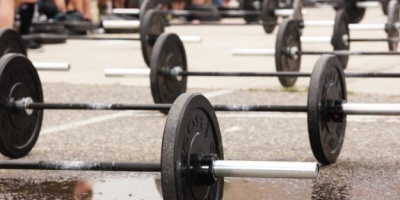 Moving it between workouts is not feasible. In the past, your best option to deal with this was to get a pair of portable squat stands. The bar catches on some of them only have a short vertical stopper above them for you to walk or push the bar into when re-racking, leaving you with the danger of moving the bar right over the top of them if they aren’t set at the perfect height. So it’s clear that we needed an entirely different solution to save on space. Behold! 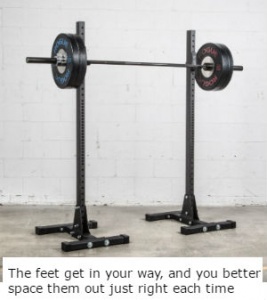 A squat rack that installs securely against the wall, folds out with the feet touching the floor for support, and folds back up against the wall for storage. Awesome stuff. Note that some makers call these wall mounted power racks. Not so fast. A power rack encloses the bar on both sides and has safety bars. These are just squat racks / half racks. It’s a marketing issue, I imagine. Credit where it’s due – The first one of these was invented in 2014 by PRX Performance, backed by “Shark Tank” businessman and investor Kevin O’Leary in 2016. This contraption was pioneered by PRx Performance. We sometimes make the mistake of thinking Rogue comes up with all this new stuff, but often they just popularize an existing idea by putting their huge market share behind it. There’s plenty to compare between the brands I’ve selected, and in this case they can’t be explained in a comparison chart. Read on or skip to my final recommendation below. Here’s what makes each rack stand out among the others. I’ll sum up the pros and cons of each one. 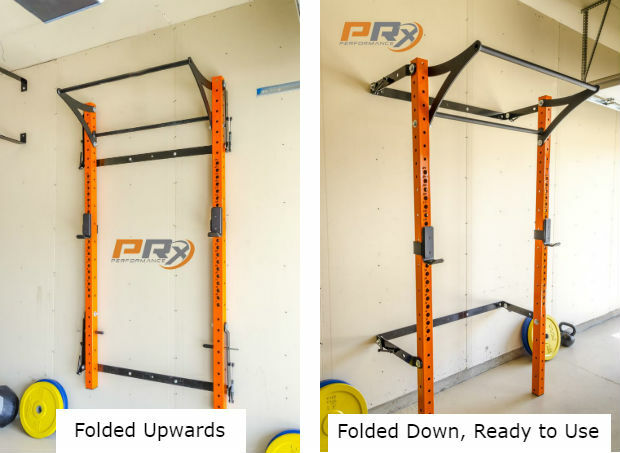 In 2014 PRx Performance invented and patented this rack. In 2016 they aired on ABC’s “Shark Tank”, a show for entrepreneurs to pitch to a panel of investors. Investor Kevin O’Leary was convinced to buy into 20% of the company. As it took off, Rogue and others copied the concept and modified the design enough to get around the patent. Folding Mechanism: Unique gas shock system that makes it effortless to pull out and fold back, with locking pins to make it child-proof. All the imitators below require you to remove the pull up bar and fold the rack parts sideways instead. I think it has to do with the patent that PRx wisely registered for. The video a few paragraphs below shows the folding mechanism pretty well. They have few models. Let me simply it. Their basic model they did on Shark Tank and have marketed most heavily is the Profile. The Profile Pro offers larger 3″x3″ steel construction (vs 2″x3″), color options, height options, and laser-cut number markings. The basic Profile rack is fine if you want to watch your spending. You don’t need those upgrades badly. 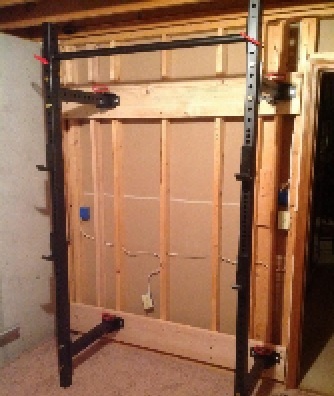 3 options – None, regular, or extruded 36″ from the wall for kipping pullups. Get at least the regular. Everyone needs a pull up bar. Keep in mind the kipping bar does not fold back itself, so it’s going to be sticking out 12″ from the wall as you fold the rack in. For most of us that’s not really an issue, as we don’t need to save space that high. Width Note: The uprights are 48″ wide, just like a normal squat rack. Their product description tells you the whole unit is 52″ wide, but they’re including the brackets, so don’t worry about that. Depth: 24″ from the wall, folds to 4″ from wall. Design and Construction: 2″x3″ 11-gauge steel, or 3″x3″ on the Pro. The folding design forces a tad bit of play in some joints, making it not feel as solid as a comparable 2″x3″ rack. That goes for all similar wall mounted racks. They can wobble a little under loads. The design is spot on though, and I don’t think anyone would feel unsafe with it. So to sum up, this rack is the original and is still one of the best here. These are surprisingly hard to find on Rogue’s site. You have to look in the Power Racks category, not in Squat Stands or Wallmounts (which is only wallmount rigs, I guess) where you would expect them. Rogue put “Westside” hole spacing on the uprights of the R-3W. What this means is 1″ on center between the bar catch height adjustment holes in the height range you would use for bench pressing. Higher than that they are spaced 2″, which is fine for squats or overhead presses. This pattern of spacing was popularized by Louie Simmons of Westside Barbell, hence the name. They have other marks on the uprights to help you put the two bar catches at the same height and not have to eyeball it too hard. Rogue, Titan and Fringe all use a similar folding mechanism, so I won’t repeat the whole description every time. To fold it away, you first remove the 2 pins above and pull off the pull up bar. Then pull 4 pins from the rack hinges and fold both arms against the wall. The hinges go both ways, so you can fold them both in, both out, or one in and one out, whatever works for your space, standing out only 5″ from your wall. If you have the wall space available where you can fold at least one side outwards, you won’t have to remove the J cups. Otherwise, not a big deal. Max height 87″, adjustable down via pop pins. Like the Titan and Fringe models, be conscious of what height you’re installing the top horizontal tubing against the uprights, because it will get in the way of your desired pull up bar height if you aren’t careful. For an even beefier rack, they have a RML-3W Monster Lite series wall mounted rack, ie; 3″x3″ 11-gauge steel. This compares to the R-3W with 2″x3″ steel. The J-cups on the 3″x3″ are of course 1″ wider to fit. Those are the only differences between the two Rogue sizes. Note that this makes the 3″x3″ rack two inches wider, to 49″, which is pushing the limits to fit the 52″ center shaft of a bar over it during normal use without accidentally hitting the bar’s shoulder, and worse case, failing to rack it and risking damage or injury. Both the 2×3 and 3×3 version has either a 20.5″ deep or 40.5″ deep option that you select on the product page. The 20.5″ gives you enough room for squats, bench presses, and most any other racks exercises, giving enough room for your feet, head, and bench, as appropriate. For movements like kipping or butterfly pull ups, muscle ups, or toes-to-bar, you want the 41.5″ deep. The 40.5″ deep doesn’t fold in neatly to the wall and will overlap unless you fold them one in and one out, which takes up more wall space. Either way works, depending where you want to save the most room when folding it. Will Haddad shows you what it takes to install it, unfold it, and fold it, and how does holds up under some heavy lifts (405lb?). Of course, it would be surprising if something from Rogue were not heavy duty and well-tested. A huge plus to Rogue’s model is the $50 stringer option, above. You get those two steel backplates. They aren’t there to look cool. Perfectly spaced mounting holes for the rack so that installation is way easier. No guessing about where to drill holes, and then having a disaster when you drilled a hole 1/4″ off. No need to go to the lumber store and pick up and cut some 2×6 boards to use as backplates. Easily worth the $50 in cost and time. Extra stability for the rack. Wood can flex and give a little. The steel makes the rack feel more solid and protects anything from getting tweaked if you’re rough with it when folding it up. I should note that another of Rogue’s racks is a single-station wall-mount rig, the W-4. They’ve had these for much longer. They’re basically a single station from the existing rig setups that are normally multiple squat racks with pull up bars all attached to each other for group classes. The main caveat with these is they are not foldable and they’re really deep (6ft!). 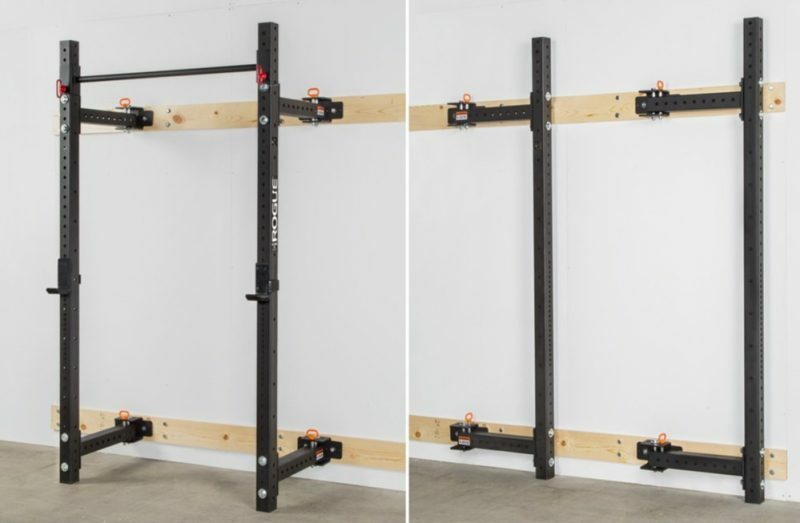 You’re stuck with it as sort of a really big power rack with no safety bars, but a pull up bar that can be mounted nice and high. Therefore it doesn’t entirely fit into this article, but I thought I’d mention it. Titan basically does low-cost Rogue imitations. Sorry, but it’s true. And they do ok at it. They’ve been at it a while and have gotten better and better with their design considerations. Depth: They make a 21.5″ deep and a 41″ deep model, very close to Rogue’s depth choices. Pull Up Bar: They put on an unusually thick 1.5″ pull up bar (most people prefer 1.25″). The max height is 86″, adjustable down to any height, but like Rogue, the top wall support arms have to attach somewhere too, so you need to put some thought into it when doing the install. will get in the For kipping pull ups, you probably want the 41″ deep, as 24″ is about the minimum depth you want for enough margin for sloppy form. If you’re 5ft tall, 21.5″ could be fine. Here I’m talking about the outside width of the rack’s uprights. Normally power racks are 48″ wide. Titan makes their rack 50″ wide. I don’t understand why. It’s an issue. The problem is virtually all 7ft olympic bars have a shaft length of about 52″ between the shoulders. When setting it on a rack that gives you only 2″ of play side-to-side. NOT GOOD for trying to re-rack a heavy weight safely. 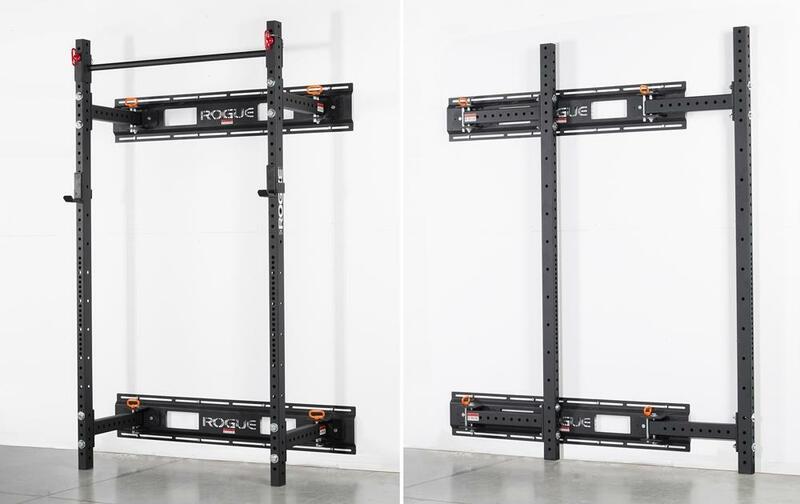 For comparison, as mentioned above, Rogue’s 2″x3″ rack is 47″ wide, and their 3″x3″ is 49″ wide. Even that mere inch difference on the latter gives you another 50% more play when re-racking your bar and can make the difference between a good workout and a hospital visit. That’s the thing about Titan. They make weird decisions, or they don’t always think things through. Over the last few years they’ve improved some designs, but it reflects an initial lack of understanding of why other brands of equipment are designed the way they are. Still, they’re way cheaper if that’s your cup of tea. Fringe has a 365-day return policy, which I think is the most generous in the whole industry right now. You get free shipping to begin with, and then you can send it back within a year, on a whim, and get all your money back. Or within 30 days and they’ll even pay return shipping. Evidently they don’t get many returns, or they wouldn’t be able to do this. Fringe split the difference and did 2.5″ square tubing instead of 3″ square or 2″x3″. They only have a single model, and no options. That makes things easy! Pull Up Bar: The pull up bar can adjust from 70″-88″ from the floor (5’10” – 7’4″). It’s 25″ from the wall, giving you just enough space for kipping pullups with a margin for sloppy form. Width: 49″ wide, the maximum width you want for a rack. Depth: 25″ from the wall, an inch deeper than PRx’s rack. Folding Mechanism: Just like Rogue. Fold either side in or out. It takes the same amount of work, pulling out 4 pins for the pull up bar and 4 for the rack hinges. Like Rogue, you can leave the J cups in place if you’re folding at least one side outward. Rogue’s quality is the highest and most consistent. Titan for example does ok with some things, but this rack needs to be all perfectly aligned so that you can install it with nothing weird going on in its stability, connections, and fold-up procedure. Titan cuts corners with design to lower the price. I trust Rogue the most with having everything made right. Rogue sells more of these types of units than anybody else. If I were in the market for a rack like this, the lack of a stringer on the other models is the absolute dealbreaker. It assists in a big way with installation and stability, and for only $50, come on, easy choice. Titan has 50″ wide uprights, measured to the outside, does not leave enough room for sloppy re-racks. Rogue’s is better at 49″. It’s a little higher priced than Fringe, but still in the ballpark. PRx is ridiculously priced. If you want 3×3 uprights or a deeper rack, Fringe is not an option. 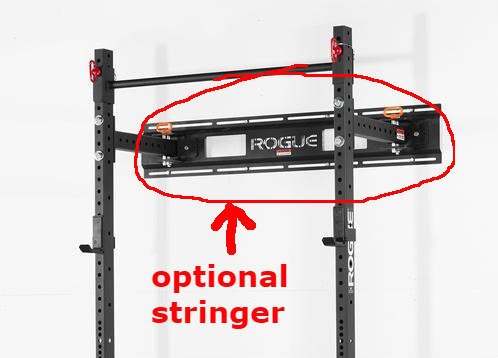 Being as this is an R-series rack, Rogue’s Infinity attachments will fit this rack. Some appropriate ones would be the landmine base, rope anchor, and many more. That opens up a options for more exercises and even more efficient use of space. The other brands don’t have these kinds of possibilities. 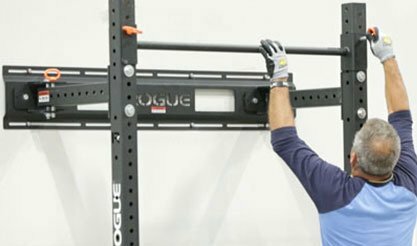 Rogue basically offers so many of the best features of these racks that it’s an easy choice. What an amazing article!!! Thank you!! David i have a question on the Titan rack. 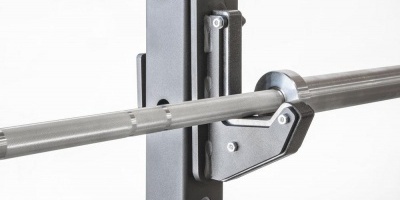 If you don’t / wont us the pull up bar is the Titan for cost saving purposes able to just move the to fixtures in 2 inch’s when installing to eliminate that awkward 50 inch width. That would make it not possible to mount the pull up bar to hold it in place. Since the fringe is 2.5” x 2.5”, would it be incompatible with the accessories from titan or rogue? Thanks for this article. 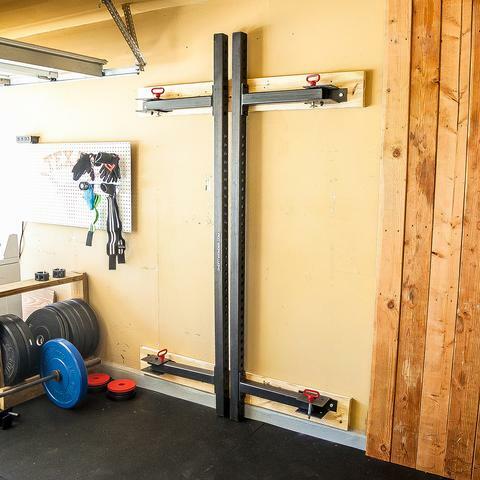 Basically answered the questions I had trying to build out my space constrained “garage” gym. Basically, used this blog post as a reference guide as I looked at the options. Good stuff! I’m glad it answered your questions! Have you figured out the best solution? Sorry Tom, just saw this! Or basically those Matadors will fit any other 2″x3″ or 3″x3″ rack with 1″ holes. Many dip attachments are pretty universal in that way. The major incompatibility to watch out for are racks that have smaller than 1″ holes. I hear you! It’s definitely nice to have a power rack if you’ve got the space.